Soy is a natural product and is a renewable American crop. It gives you the best scent throw which makes for a great smelling candle. 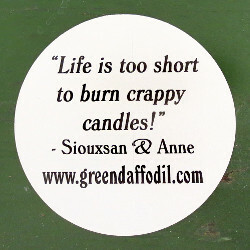 And after all, that’s really what we all look for in our scented candles! On average your 4 ounce tin will burn 20 hours. Of course your burn time may vary depending on the placement of your candle in your room. Check out each candle listing to see the average burn time for their size. It’s important that you always keep your wick trimmed to 1/4” to enjoy a smoke-free burning experience. This will also extend the life of your candle. Although we do use some organic materials the short answer is no. We instead use the next best quality ingredients available; no dyes and none of our products have been tested on animals, except us! They are cheap plastic fillers sometimes used in fragrance oils. We do not use these types of oils since they are inferior and unhealthy. What is the shelf life of your goods? Everything is made to order to ensure freshness and we recommend that you store your products in a cool, dry location. We know our bar soap makes your underwear drawer smell nice, but you really need to use your products within a year. Can I order in bulk for my special event? Yes! We love being “invited” to special events. Please contact us directly to discuss your individual needs. Mrs. Rosemary Candleton is our fictitious founding mother. She and her husband, Wick started what is now known as Green Daffodil back in the 1920’s. She is our soundboard we turn to for guidance and is occasionally called upon to to handle telemarketers! Our products are all ‘Green’ and who doesn’t love a Daffodil; poking it’s head out of the ground all happy and cheery after a long cold winter. So we like to think that Green Daffodil = Eco Happy! First off we want you to be happy! We stand by our products and guarantee that you will get what you have ordered as described on this web site. All of our products are handmade, so there will be subtle allowable variations. If you are truly unsatisfied, please let us know so we can make it right! What's your shipping? When will I get my goodies? We carefully package each order as soon as it comes in. Remember it is handmade so it might take up to 5 days for shipment, but really we are much quicken than that! We ship via USPS, mostly priority mail! What’s floating in my candle? We put dried herbs in our candles for color and interest. But no worries, the herbs are not flammable. We only use lead-free 100% cotton wicks for a cleaner burn.